There are surprisingly few twin-stick shooters with rogue-like elements on the market at the moment. 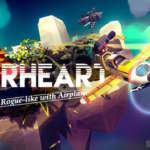 Blindflug Studios AG hopes to capture some of that genre’s audience with their new PC game Airheart Tales of Broken Wings. This title, currently in Early Access on Steam, is about a young woman named Amelia who has inherited her family’s sky fishing business. If “sky fishing” sounds odd to you you’re not alone, and despite that being the main hook of the game’s story you’ll spend far more time fighting pirates than actually fishing. Despite the emphasis on combat the game tends to be slower paced and more for casual audiences than its contemporaries. 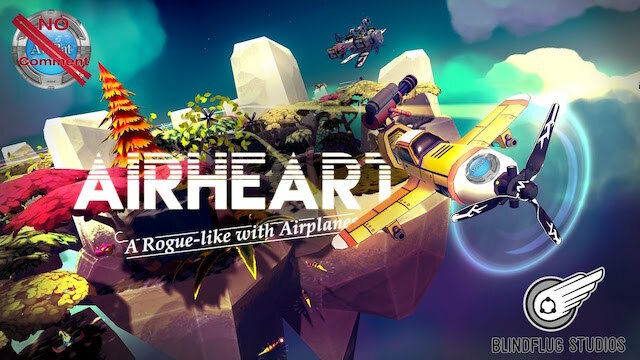 The core gameplay in “Airheart” is rather straightforward. You will exit your air garage in your customizable plane and ascend to a higher altitude, where you will begin to farm fish for oil. The first level is tame with only the occasional pirate to harass you, but the number of fish available is limited. When you climb to the next level up the pirate population booms. Each successive altitude increases the difficulty, and this can sometimes be quite a drastic shift. Enemies in Airheart will offer oil, upgrades or temporary power boosts, and you’ll want to get as many of each as possible. The upgrades come in the form of plans, and you’ll need to collect a certain number of each plan to craft the weapon or part it describes. It can take a little while to acquire upgrades at first, but it won’t be long before you have a collection of plans and items built up. One thing I want to point out since I think it is pretty neat is that the game includes a recoil system where your shots will slow or push your plane accurately. 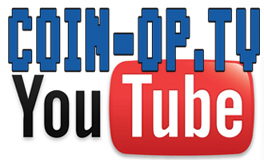 Most games of this genre don’t have anything like that, and it is a surprisingly effective touch. Airheart Tales of Broken Wings is still in development, so it is hard to give a definitive verdict on it at this point, but in its current state it is hard to recommend. While there are no glaring problems with the game it also doesn’t yet have much to offer, and even at $14.99 it feels a bit overpriced. The game just doesn’t have any depth to it, and though that may still be coming down the road it isn’t here yet. The game is mostly devoid of story, which leaves the core gear grind that the game is built around to carry it. As updates are pushed out (at least two have already come out since launch) I will continue to revisit the title since I do think this can be a good game. There is some good news, though, if you go to the game’s website you can download a free demo to try things out risk free, which is always a nice perk. Ultimately, this is a game to keep an eye on, and might even be worth grabbing if it goes on sale for the right price, but it is hard to recommend just yet.